- Windows XP/7/8/10. Vista is not tested yet. Now you will have default custom icons and play & edit actions in context menu. • You can either locate legacy version or the new version, it makes no difference. Since it's only used for locating the default icons in the directory. 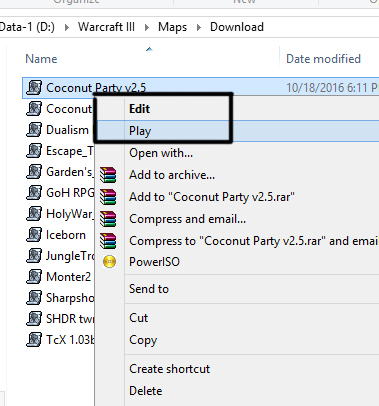 - Renamed to "Warcraft 3 Extension"
What about JNGP WE? Are the parameters same? Well, it's only tested on w7 and w8. @pyf: I have updated it. Hopefully it works for XP now. Damn I have been needing this for years! Excellent. Is the ending symbol for 'edit' and 'play' supposed to look like this? A CnP in Notepad shows this weird last symbol appears to be a question mark. No, there shouldn't be a symbol at the end. Must be a bug. Easy to use. Works perfectly. Perhaps make it look up the install folder from the registry, this way it would just be a matter of two clicks and things would be working. In any case, approved! This doesn't work for me. The entries don't appear in the list. This is some awesome stuff, Quilnez! This will help me out so much in moderating submissions thank you for making it! P.S - This was on Windows 10 Home 64 bit. I didn't have any issues when following the instructions. Add "-loadfile" (no quotes) before "%1"
Well I don't need that as I just stated that I manually did the change. Ooooh... For a long time now I could click on a map file to open up the WE, but it couldn't seem to figure out where the map itself was; it just opened a blank WE. This seems pretty schweet. I've just found you can't directly play a map if the folder name (that is containing the map file) is too long. I think he was talking about what it was like before he downloaded your tool.